In an old iron mine a half-mile under the northern Minnesota woods, the Cryogenic Dark Matter Search (CDMS) found signals that could be three possible particles. What’s potentially exciting is the nature of these particles: if follow-up experiments confirm this discovery, they could be the first direct measurement of dark matter, the mysterious invisible substance comprising 80% of all the matter in the Universe. The hunt for dark matter particles is ultimately a quest to understand the structure of the cosmos, and ultimately how galaxies like ours exist. Dr. Franics is a science writer and educator . Articles about physics and astronomy regularly appear at Ars Technica and Double X Science, where he also serves on the editorial staff. His writings have also been featured on BBC Future, the New Yorker‘s “Elements”, Wired Science, the Scientific American Guest Blog, Culture of Science, and the 365 Days of Astronomy podcast. 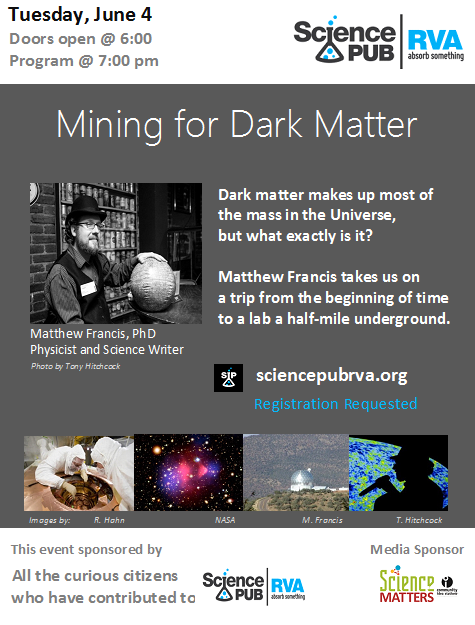 Additionally, he blogs about science, science communication, education, and culture at Galileo’s Pendulum. Dr. Francis is also the Director of CosmoAcademy and he is currently writing a book on cosmology, with working title Back Roads, Dark Skies: A Cosmological Journey.